As a life-long PC gamer, the concept of a Steam Machine to me seems unessential. But in talking to someone who’s been a traditional console gamer, the appeal becomes a little more clear. It's a gateway that breaks down a traditional high barrier of entry. It provides a simple solution to access a library of thousands of PC titles with minimal knowledge of hardware and software. A Steam Machine can be manufactured by anyone, in fact, you could technically build your own. Today we’re going to look at an offering from Alienware. This month the first official Steam Machines are hitting the market, the concept of them is simple - console like specifications built on top of an OS designed by Valve to run SteamOS games. SteamOS games are more or less Linux versions of a title, and while the Steam Store might boast over 6000 games to play, SteamOS compatible ones number a little over 1000. Still, for a console gamer the choice of games to play at launch is quite staggering compared to the dozen or two that are normally found. 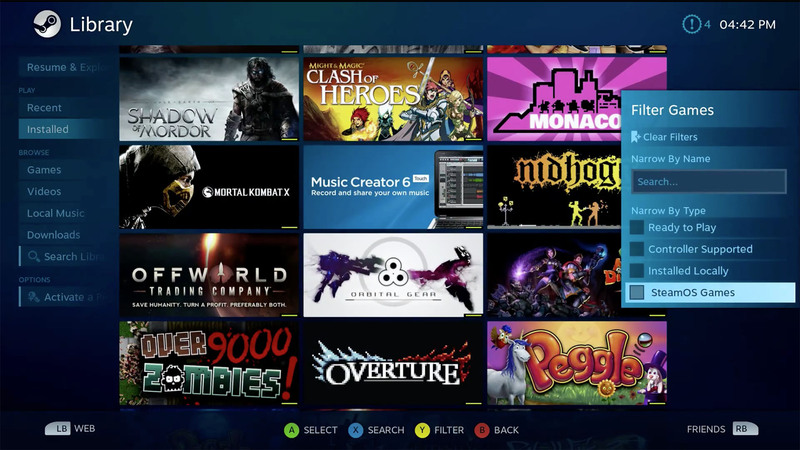 The Steam Machine and SteamOS are designed for the living room. Alienware has built a truly gorgeous piece of equipment that is smaller than a Nintendo Wii, donned in all black, with a lit up Alienware and Steam logo. Configuration options include three different processor levels, varying hard disk sizes, and additional RAM as well as some flexibility on the wireless capabilities out of the box. The box also features HDMI In/Out, Two USB 3.0 Ports, and a gigabit ethernet jack for wired connections. Prices start at $449 all the way up to $749. Our model was the lower end $549 model with an i3 Processor, 8GB of RAM and a 1TB hard drive. One slick little thing Alienware has done is built a USB port into a panel at the bottom of the unit to hide the Steam Controller adapter, making it incredibly easy to tuck this unit inside an entertainment center. If you’ve used Big Picture Mode on Steam, you’ve basically used Steam OS. There are some additional features and functionality found within the interface, but more or less the core experience is identical. What’s good? It’s fast and easy to find the games you want to play amongst a library of hundreds. You have access to just about everything you do in the desktop version of Steam including the Store, Community features, Groups, Videos, and more. One feature I really like is the ability to put on a “video screen saver.” This will pull trailers from the Steam store and display them while the system is idle. You too can have your very own Gamestop kiosk in your living room. What’s not? There are still certain areas where there’s too much text or it’s difficult to read. You can also mis-navigate quite easily as it’s not always clear how to get to the next function. Some of the features definitely aren’t the easiest on the TV, specifically some of the social aspects. Steam currently has over 6000 titles available on the service, and while a good chunk of those have come in recent years from smaller independent developers, there’s still a solid array of AAA titles to be found. Steam OS games need to be compatible with Linux and Big Picture mode to be capable of running on a Steam Machine. That means you have a little over 1000 titles to choose from that are playable. Titles like Borderlands 2 and The Pre-Sequel, Dying Light and X-Com are all available. Quirky titles like Broforce, Ark: Survival Evolved, and Crypt of the Necrodancer are also there. Of course all the Valve titles like DOTA 2, Counter-Strike: Global Offensive and the Half-Life series can be yours too. There are plenty of GOOD games, but the problem is not every new big PC release will be there, and it’s likely to be on a console or Windows instead. All of that said, folks not familiar with Steam will be happy to see the Winter Sale hit later this year and realize they can pick up dozens of games for very little cash. This is something that hasn’t quite been replicated in the console market yet. Not only that, I wouldn’t be surprised to see sites like Humble Bundle and Indie Gala launch SteamOS bundles in the near future to cash in on the craze. These bundle sites are where half my library has come from. We’ve updated our database on Co-Optimus to include flags for SteamOS compatible co-op titles, so be sure to add that filter when looking for PC co-op games. There's plenty of great ones to play, and we'll definitely be highlighting them in a separate article soon. Of course if you do have a Windows PC in the “office” then you can stream from that. I’ve been streaming PC games for over a year now to the NVIDIA Shield Portable. It’s worked great and it works regardless of the platform - Steam, Origin, Uplay, etc. This is a huge advantage if you own a GeForce card. Steam’s streaming will only work for Steam titles. In my testing I HAD to be wired to get decent gameplay, and even then, performance was iffy. Definitely not up to par with the NVIDIA Shield. As it stands currently, I don’t think the Steam streaming is quite perfect, but it’s passable. Page created in 0.5897 seconds.